Amanda Irvin is Director of Faculty Programs and Services at the CTL. Amanda develops and facilitates professional development programs for faculty, postdoctoral, adjunct, and other instructors at Columbia. Through the design and implementation of pedagogical programs, consultations, and resources, she encourages engaged, reflective teaching and learning. 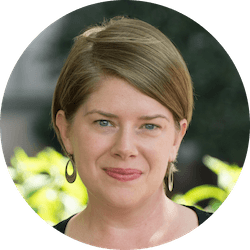 Amanda specializes in Feminist pedagogy, collaborative learning, and active learning. In addition to being a certified Team-Based Learning Collaborative expert consultant-trainer, she is also trained in Bystander Intervention to prevent sexual assault on college campuses as well as Question, Persuade, Refer (QPR) Gatekeeper training to prevent student self-harm. She is committed to improving teaching and learning in our local, national, and international communities. Prior to joining the CTL, Amanda served as Assistant Director of Faculty Development of the Koehler Center for Teaching Excellence at Texas Christian University. She was also an affiliate faculty in the Department of English and the Women and Gender Studies program. She teaches courses in American Literature, Composition, and Women’s and Girls’ Studies. Amanda holds a Ph.D. in English – American Literature and a graduate certificate in Women’s Studies from Texas Christian University, an M.A. in English and a graduate certificate in Women’s Studies from Radford University, and a B.A. in English and undergraduate certificate in Women’s Studies from the University of Central Florida. In her spare time, Amanda enjoys reading, writing, practicing yoga, and cooking.